With its launch about to occur within just a few days, today its time for wireless charging on the Samsung Galaxy S6 to pay the rumor mill a visit. Or the FCC, to be more precise. After rumors of metal unibody on the upcoming flagship surfaced, there were conflicting reports about whether wireless charging would indeed be feasible on the Samsung flagship. Well, a couple of wireless charging accessories previously associated with the Galaxy S6 popped up on the FCC website today, so we can begin to understand more about whether Samsung’s going to make the plunge on its upcoming devices. Samsung Made Wireless Charging Pad Appears On FCC Website – Could Be Headed For The Galaxy S6? The charging pad, as can be seen in the image above will be circular. What’s more interesting is the model number for the device, EP-PG920I, which has already made an appearance earlier on as well with a list of accessories rumored to come with the Galaxy S6. 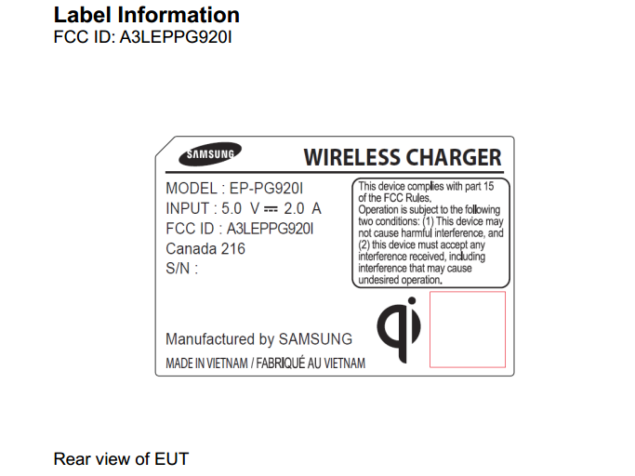 Could the device’s appearance on the FCC just days before the launch of the Galaxy S6 and the S6 Edge be a co-incidence? Or is it really headed for approval to the authority for its appearance, and subsequent availability after the flagship launch next month? We’ll know for sure soon. Samsung’s upcoming flagship devices have been the talk of town for more than a month now with top notch features speculated to come with them. The devices will potentially be the first to showcase Samsung’s in-house 14nm Exynos 7420 SoC, which according to several leaked benchmarks is expected to give major players in the industry a tough time. They’ll also be the Korean giant’s first smartphone flagships to sport a metal unibody. The start of March is a big month for Samsung and the mobile world, and whether its able to live up to expectations, only time can tell. Stay tuned. We’ll keep you updated.